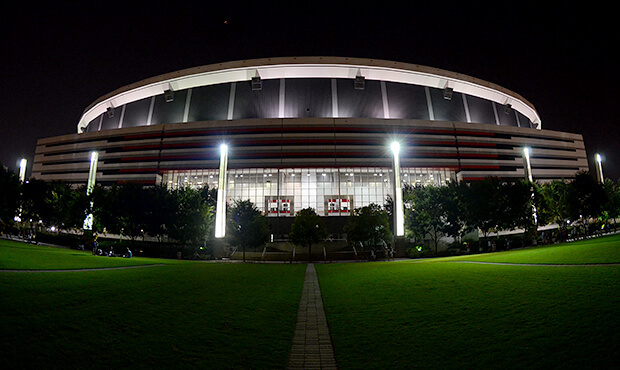 The Georgia Dome will host the DCI Atlanta Southeastern Championship on Saturday, July 26. Results from the DCI Southwestern Championship on July 19 in San Antonio, Texas determine the performance order for the DCI Atlanta Southeastern Championship. Once seeded in score order, corps were drawn at random in groups of three (First through third, fourth through sixth, etc.) to determine the performance order. DCI Southeastern Championship The Atlanta Georgia Dome Saturday, July 26 11:00 a.m. – Gates Open 11:15 a.m. – SoundSport Competition 11:15 a.m. Rocketeers – Huntsville, AL 11:25 a.m. Southwind – Mobile, AL 11:35 a.m. University of North Georgia – Dahlonega, GA 11:45 a.m. Medellin Gran Banda – Medellin, Colombia 12:30 p.m. – Kick Start Leadership Workshop 2:30 p.m. – Carolina Gold 2:47 p.m. – Atlanta CorpsVets 3:04 p.m. – Pioneer 3:21 p.m. – Jersey Surf 3:38 p.m. – Cascades 3:55 p.m. – Mandarins 4:12 p.m. – Pacific Crest 4:29 p.m. – Oregon Crusaders 4:46 p.m. – Intermission – DrumLine Battle: Mandarins vs. TBA 5:37 p.m. – The Academy 5:54 p.m. – Troopers 6:11 p.m. – Spirit of Atlanta 6:28 p.m. – Colts 6:45 p.m. – Madison Scouts 7:02 p.m. – Blue Stars 7:19 p.m. – Crossmen 7:36 p.m. – Phantom Regiment 7:53 p.m. – Intermission 8:10 p.m. – Boston Crusaders 8:27 p.m. – Blue Knights 8:44 p.m. – The Cavaliers 9:01 p.m. – Carolina Crown 9:18 p.m. – Santa Clara Vanguard 9:35 p.m. – Blue Devils 9:52 p.m. – Bluecoats 10:09 p.m. – The Cadets 10:38 p.m. – Scores Announced Eastern time zone. All times approximate and subject to change. Buy tickets to the DCI Southeastern Championship.